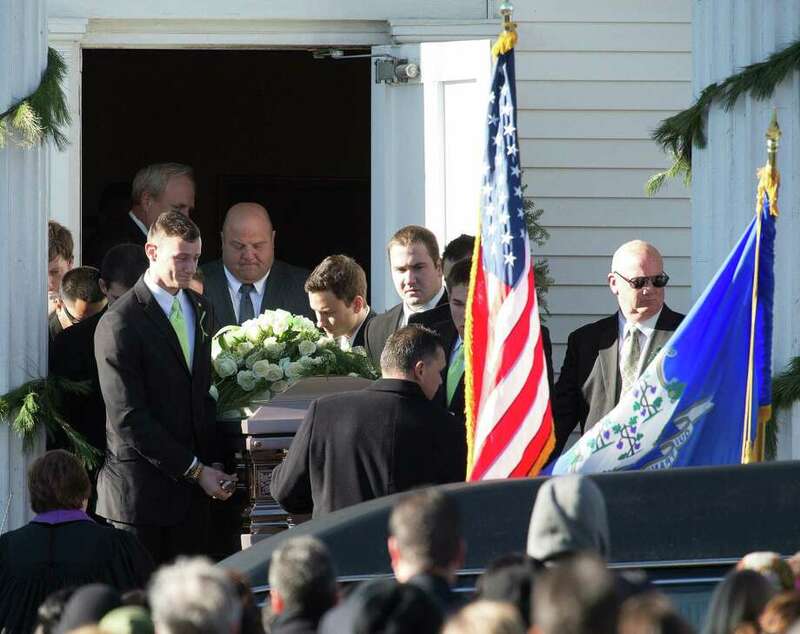 Mike Ross Connecticut Post freelance -A casket carrying the body of teacher Victoria Soto, 27, leaves Lordship Community Church on Dec. 19, in Stratford, Conn.
STRATFORD -- Clad in green ties, sweaters and scarfs, Victoria Leigh Soto's loved ones gave heartfelt tributes Wednesday to the blue-eyed teacher who died trying to protect her students during last week's mass shooting in Newtown. Hundreds of mourners gathered at Lordship Community Church to say farewell to the young woman, known as "Vicki," who loved dancing, flamingos, crispy macaroni and cheese and cupcake eating contests. The service included a touching performance by Paul Simon, a New Canaan resident, who played "Sound of Silence" on an acoustic guitar. Jillian Soto said her sister Vicki, whose favorite color was green, has been called a hero for hiding the students in her first-grade class and telling the shooter they were somewhere else. "But truthfully you have been a hero to me for a lot longer than five days," she said, reading from a letter she wrote. Jillian said she copied everything her sister did and decided to attend Eastern Connecticut State University the moment her older sister enrolled. Vicki graduated from Eastern with high honors and degrees in education and history and was pursuing her master's degree at Southern Connecticut State University. "Please guide me as I try to take on this world without you," Jillian said. Another sibling, Carlee Soto, cried as she recalled the last time she saw her 27-year-old sister, one week ago. The two got scolded by their mother for playfully throwing candy at each other. Carlee, who called the pain of losing her sister "unbelievable," said their mother was worried Vicki's dog Roxie would eat the candy and get sick. Roxie, according to Soto's obituary, would wait for her to come home every day and "is still waiting, lost without her." A common thread throughout the service was Soto's love of Christmas. A cousin said Soto insisted on having a family gathering each Christmas Eve. Her aunt and godmother Debbie Cronk, said she gave Soto a new Christmas ornament each year to help build up a collection for the day she got a place of her own. Cronk said she bought one last ornament Soto could take with her to heaven. With the church sanctuary filled to capacity, hundreds of mourners stood on the small white church's lawn listening to the service through speakers set up outside. When the dark gray casket arrived, the state police Honor Guard gave a salute to the teacher who gave her life to protect her class.